User experience (UX) design has a solid foundation in the consciousness of libraries. At last year’s LITA Forum there were three sessions with “UX” in the title, one for each day of the conference. UX design has made libraries more—to use Aaron Schmidt and Amanda Etche’s phrase—useful, usable, and desirable for users. However, as an application specialist I primarily work with staff that run the daily operations of our library systems, such as our integrated library system and interlibrary loan applications. I wondered how the insights of user experience design for front-end users could be applied to back-end users to help me do my job. How could I make working with library systems less frustrating for staff, to help them better serve our users? While I found an abundance of library-specific literature on user experience design, I found nothing for employee experience (EX) design. For this I had to look elsewhere, primarily recent HR and business literature where EX is trending. While EX is still in its infancy, I strongly feel that it needs to be articulated in a library context. This post is an attempt to explain the value of EX for library systems staff, to start a discussion of how systems staff can use EX to improve the employee’s experience of library technology. Image courtesy of Flickr user NPL Newburyport Public Library. CC BY 2.0. Libraries exist to serve users, not themselves. But that doesn’t mean basic steps can’t be taken to make employee’s daily work less exasperating, especially when it comes to library technology. EX—like UX—takes as its subject how one feels when interacting with organizations, physically or digitally. One author defines employee experience design as, “designing an organization where people want to show up by focusing on the cultural, technological, and physical environments” (The Employee Experience Advantage, Jacob Morgan, p. 9). Essentially, the argument is that creating better experiences for staff is a win-win: improving EX improves employees’ ability to serve users. 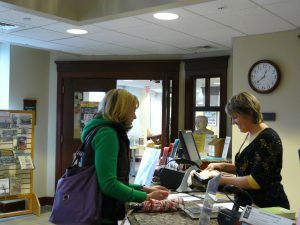 Library systems staff resolve short-term problems with checking out books, requesting books or articles, bulk importing MARC records, and other daily processes. However, systems staff are also in a position to resolve long-term issues. For example, a lack of documentation can result in the loss of crucial institutional knowledge as staff come and go, recreating problems that were already solved and long forgotten. Or perhaps staff do not share problems and develop workarounds that only create more problems. It’s these long-term issues that can make working with library systems a painless service or a never-ending series of frustrating experiences. While EX may sound good in theory, how can we use it in practice? How can we improve something as intangible as the employee experience? By breaking it down into its component parts, or touchpoints. When users interact with libraries, what or who do they interact with? What points do they touch? Touchpoints can be things like the library’s website, service points (circulation, reference), physical spaces, etc. These interactions and their response—positive or negative—produces an experience. The goal of UX—and EX—is to, “manage…touchpoints so that, together, they provide a great experience,” (Useful, Usable, Desirable, Aaron Schmidt and Amanda Etches, p. 2). In other words, if we identify touchpoints that make up the user or employee experience, we can develop ways to improve them and create better experiences. This matters because great experiences makes libraries places users want to keep coming back to, not just because they need to. The same can be said for staff. Ideally, staff want to keep working where they are. Yes, it is staff’s job to use library systems—frustrations and all—but such frustrations can impact the user experience if staff are constantly thwarted in their work. While there are established user experience touchpoints for libraries and library technology, employee experience touchpoints are a new frontier, and those related to library technology even more so. When staff interact with library systems, what do they interact with? 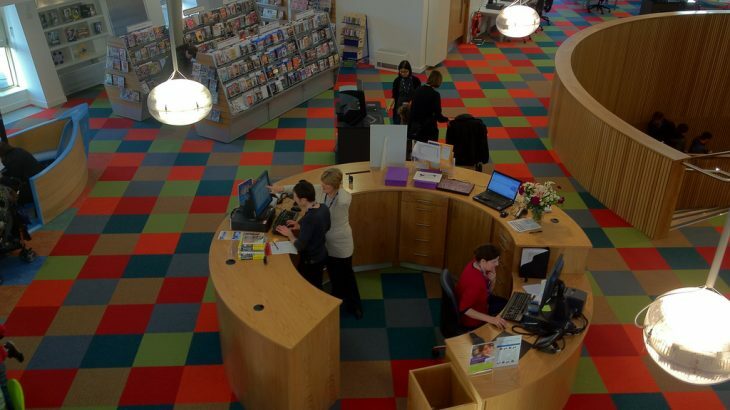 What makes up the employee experience of library systems? Based on my observations, four touchpoints are library applications, technology, support, and documentation. Library applications are an obvious starting point, but the staff experience doesn’t begin and end with applications themselves. What do they run on? Library applications are either installed on a desktop computer or are accessible via the web. What if there’s a problem? Staff interact with support to resolve problems, whether that means an email to a support system or a tap on the shoulder of someone near them. However, staff can also resolve some problems by troubleshooting or reviewing relevant documentation, whether internal or vendor-created. For example, if staff forget an infrequent part of their workflow, consulting a written procedure could quickly clear up confusion. These four touchpoints—library applications, technology, support, and documentation—may appear obvious, but the problem is that these “obvious” things are not considered in tandem as components of a larger experience. This perspective enables us to develop ways to systematically make the staff experience with technology less annoying. While EX may sound like a luxury for larger libraries, EX doesn’t have to be resource-intensive. At a minimum it can mean following simple principles and tackling low-hanging fruit when opportunities arise. What follows is a preliminary list of such opportunities, organized by touchpoint. How is your library addressing these touchpoints? Can you think of other ways to improve the employee experience of library technology? Original Content, Website management and User Experience user experience, ux. permalink. I am beyond pleased to see this issue discussed. Twenty-one years of thinking about EX in my library without having a term to identify it. Glad to hear I’m not the only one thinking about this! What issues are you facing, and how are you addressing them? Were there any important issues I didn’t discuss?